How long will it take to deliver my KatKabin? We aim to deliver the KatKabin within 3-5 working days - however, we can often deliver more quickly! Your KatKabin will be delivered by our couriers, who are extremely efficient and reliable. How can I get my cat used to the KatKabin? Most cats take to their KatKabins straight away as they are very inquisitive and curious. If your cat needs more persuading then we have a few ideas for you. The best way of getting your cat used to his KatKabin is to have it in the house placed close to where he normally sleeps. Leave the KatFlap off initially - this makes it easier for him to get in and out. If you sit near the KatKabin and make a big fuss of him when he comes over to you he will get used to seeing it. Then you can gradually introduce him to the KatKabin by using treats. Put a few just inside the door, and he will hopefully feel the urge for a snack and put his head inside to retrieve the treat. Gradually move the snacks further inside and he will start to climb in and make himself at home. Take your time, don't rush him - and whatever you do don't force him inside, as he will just associate the KatKabin with a bad experience. Can the KatFlap be taken off? My cat hasn't used a cat flap before? Yes, the KatFlap can be removed, it clips on and off very easily. The KatFlap is made of clear plastic so that your cat can look through it, which makes it easier for a cat to get used to. How can I get my cat used to the KatFlap? One of the best ways that we have found is to put the flap on, but keep it open so that your cat can easily get in and out ( try a peg and some string!) – you need to make sure it can’t accidentally fall on him and scare him. Let him get used to going in and out of the KatKabin with the door propped open, then when he is happy with this you can move on to using treats and string - this is our patented method, but we are happy to share it with you! Once your cat is in the KatKabin give him a few treats and put a trail of string into the KatKabin, then close the door. After he has eaten the treats you can start to play with the string, gently pull it out and he should follow. He will then start to associate being in the KatKabin with treats, and will hopefully realise that it’s easy to get out again. Do this a few times, putting treats inside the KatKabin and playing with the string and soon he will be coming out like an expert! If there are treats in the KatKabin when he goes in then he will become more curious and realise that the flap is the only thing between him and a snack. Hopefully, he will then push at the flap to get in. It may take some time – but stick with it, this worked for Mutty, the Brinsea cat. Can the KatFlap be locked or can I fit a magnetic cat flap? For safety reasons the KatFlap cannot be locked, and we are currently investigating whether we could introduce a magnetic entry system, but we have no immediate plans to offer this on our KatKabins. Can two cats fit into the KatKabin? Yes, the KatKabin is big enough fit two cats. However, cats do like their own space and will only share the KatKabin if they already enjoy being cosy with others. Will other cats go in my cat's KatKabin? That's a very difficult one to answer! If you keep the KatKabin indoors for a while and let your cat get used to using it he will leave his scent on the KatKushion inside. 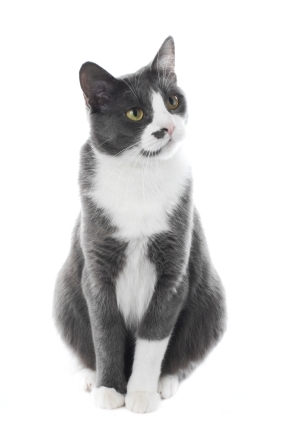 Most cats are very territorial and have their own 'patch' and will tend to avoid areas occupied by other cats. The scent of your cat on his KatKabin is usually enough to deter other cats from going into the KatKabin. I am worried that the colour will fade after a few months outside in the sun and rain. Will this happen? The KatKabin is made from a very special UV stable plastic that is totally safe for pets. Every plastic will eventually fade but the KatKabin is specially formulated to resist this process and will look great for many years. We advise purchasers to site their KatKabin in a shaded area, as this is where cats would naturally choose to be - your cat will prefer it and the materials will maintain their colour and finish for longer. Replacement coloured panels are available from us if required, and are easy to fit. How can I keep the KatKabin clean? This is very simple. Just wipe your KatKabin inside and out with a cloth, warm water and normal household detergent. The KatKushion has a removable cover which is washable at up to 60 degrees with a normal detergent. After being dried thoroughly, put the cover back on the pad and place lengthways inside the KatKabin. Gently tuck each end of the cushion into the recess in the ends of the KatKabin to make it flat and comfy. If you have the additional Winter Warmer it can be machine-washed in the same way. What makes you think that my cat would like to use the KatKabin? Cats in general like hiding away in enclosed spaces The KatKabin is an enclosed space with only one opening on the front. This makes your cat feel very secure. Cats are also naturally very inquisitive and clever. They soon discover that a KatKabin is a great place to have a snooze, being a safe haven from which they can watch the world go by. The KatFlap door provides for extra warmth during the very cold days and nights in winter but your cat might like to get used to the KatKabin first before you attach it. You can do this very easily by just clipping the door on from the outside. I want to put the KatKabin in front of my house but I am worried that it could be stolen. Is there anything I can do to stop this? Yes. The KatKabin has holes inside the feet with which you can screw to the floor. Also, if you are worried that it may move during strong winds if standing on soft ground, you can use tent pegs to attach it for extra strength. I have noticed that it stands off the floor. Is there a reason for this? Yes, the ground can be very cold in winter. The air space between the bottom of the KatKabin and the ground helps to insulate and maintain the temperature inside. For even greater warmth and comfort add the deluxe Winter Warmer to your standard KatKabin. This completely lines the interior floor and roof of the KatKabin to keep your cat warm in the coldest conditions. Place the KatKushion on top of the Winter Warmer and tuck it in to create the ultimate in creature comfort. The KatKabin looks great, why is it oval? The oval shape helps the air circulate inside. Warm air is not trapped at the top as in other shapes but circulates around. The other reason is that, because of its aerodynamic shape, any wind moves around and past the KatKabin, rather than buffeting it. What size is the KatKabin? My cat is rather large, will he fit in? The KatKabin DezRez measures 55cm (22”) long x 40.5cm (16”) wide x 32.5cm (13”) high and weighs 4.5 kilos (10lbs). The KatFlap measures 16.5cm (6 ½ “) wide x 17.8cm (7”) high. Our KatKabins have been tested by cats of all shapes and sizes, and we haven’t had any problems to date.